One easy way to get your home in the Halloween spirit is with printables! I personally love using printables and have even designed a few of my own. For free Halloween printables, you can find a ton online. It will only cost you some paper and ink. I’ve found 21 free Halloween printables ranging from decor to party planning to fun for the kids. Have a look through the sites and when you find one you want to try bookmark it or pin it to your Halloween Pinterest board. Personally, I’m loving all the decor ideas! I stopped buying Halloween decorations years ago and now rely solely on my own DIY decorations. 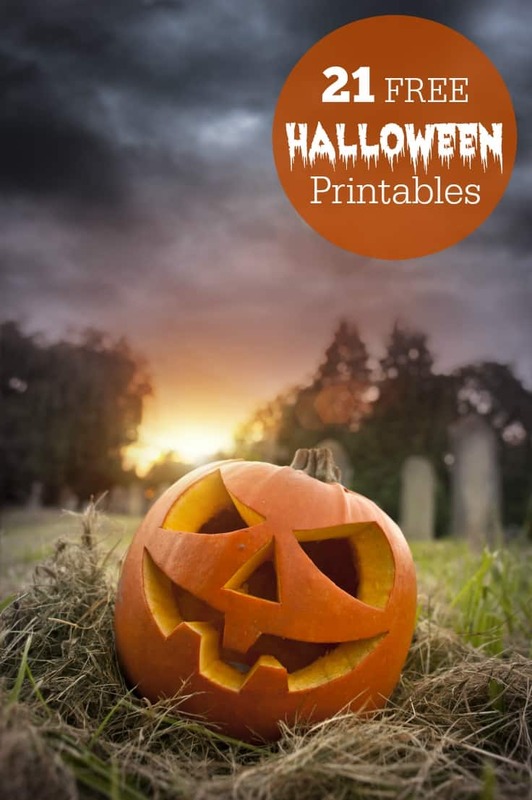 What Halloween printables from my list catch your eye? I need some carving printables, thank you! I like the pumpkin carving printouts, plus some other fun and crafty ideas here to keep the kids busy!! I like the pumpkin carving printouts and think they would be fun to try.I am always looking for new fun ideas for halloween. I like the Jack O’ Lantern Pillow Boxes. Thanks for the inspiration! Can’t believe Halloween is right around the corner! Thanks, now I have a selection for my pumpkin this year.